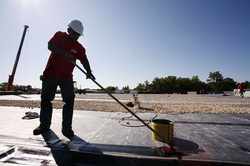 Roof Replacement on a Business or Commercial Building requires Certified Contractors and Permits to do the job correct. Flat Roofs also demand for Installation of the Highest Quality. At Rockwall Metal Roofing, we use the latest Professional Installation Methods for Commercial Roofing and Flat Roofs. We are Certified GAF, CertainTeed, and Owens Corning Installers using Top-of-the-Line Products and State-of-the-Art Equipment. Our Flat Roofing and Commercial Roofing Methods offer Solar Reflective Properties and a Higher Quality Product than the traditional roof. The Solar Reflective Properties, common in all Rockwall Metal Roofing's Commercial Roofs, create cooler roofs - which leads to cooler buildings and lower energy costs. Our Contractors specialize in Single Ply, Modified Bitumen and TPO Materials, bringing your Businesses Roof up to today's standards. We can Install at an Honest and Fair Price. We know you operate on a budget, and it's important to us that our work remain within your budget. Rockwall Metal Roofing offers Affordable DFW Roofing at Competitive Prices. Our Professional Contractors and Subcontractors were hired based on their Quality Skill Set and Integrity for the Job. We make sure your Roof is Installed properly the first time, to your specifications. Call us anytime or submit the form on the right for a FREE Estimate for Commercial Roof Installation. We would love to discuss options with your team and show that Rockwall Metal Roofing can Exceed Your Expectations.